New season and new math. 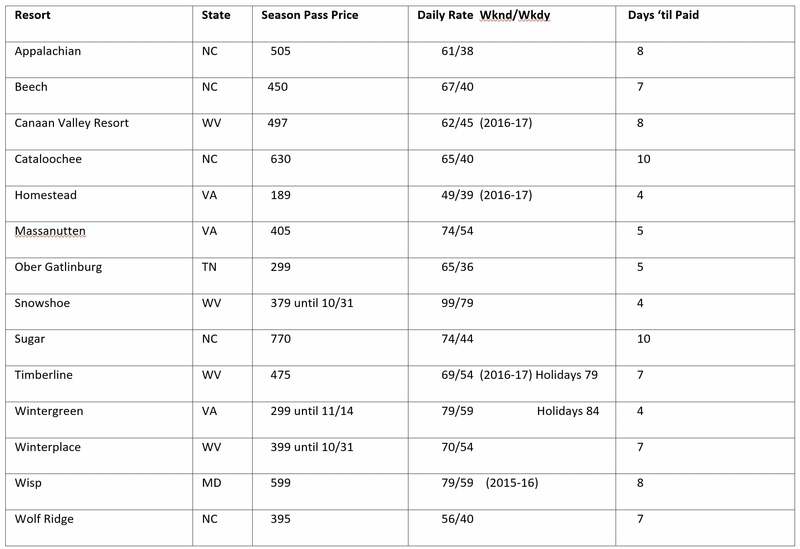 I have been keeping my ear to the ground (terrible connectivity here) and the news is out; all the resorts in the Southeast who offer season passes have published their pass prices and most of the daily rates for 2017-18; which means the ski and snowboard season will soon be upon us. Thank goodness, I’m all summered out and thoroughly tired of waiting. The Harvest Moon is on the wane already, so it’s high time for Fall to descend, in fact Autumn officially started three weeks ago. Temperatures in the upper 80’s with humidity to match, is no way to start the first part of October; a month meant for early morning frost and contented sighs as you sit outside and watch the foliage begin to change. The leaves are changing here in central North Carolina but with very little enthusiasm or apparent color. They are falling purely out of a sense of seasonal obligation, or fatigue. The annual winter forecasts are also out and I have enjoyed lambasting them in the past but I think I’ll leave The Old Farmers Almanac on the checkout line shelf this year; it’s its own joke now. Weather sites have been hardly any better the last couple of years so I will maintain my own fragile optimism seeking neither confirmation nor denial. But, here is a prognostication: Winter is coming and turns will be made. My personal hope is that there will be a sudden deep snow event in the North Carolina Highlands or more likely up in West Virginia, before November. This happens occasionally but you generally need touring gear or a willingness to hike to take advantage of it. 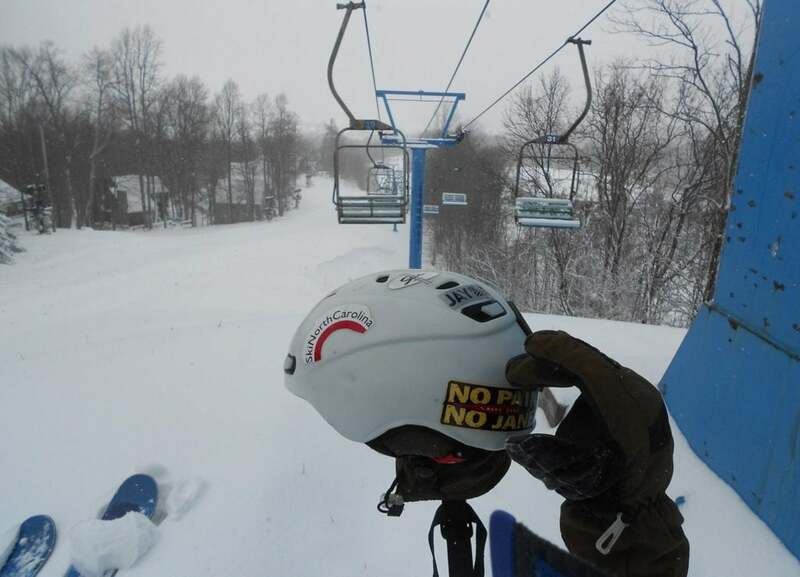 Although, Cataloochee actually opened there lifts after Sandy passed through Halloween of 2012. I was unofficially elsewhere. So that’s great when it happens but far from consistent. What is consistent is skiing during Thanksgiving in the Southeast. 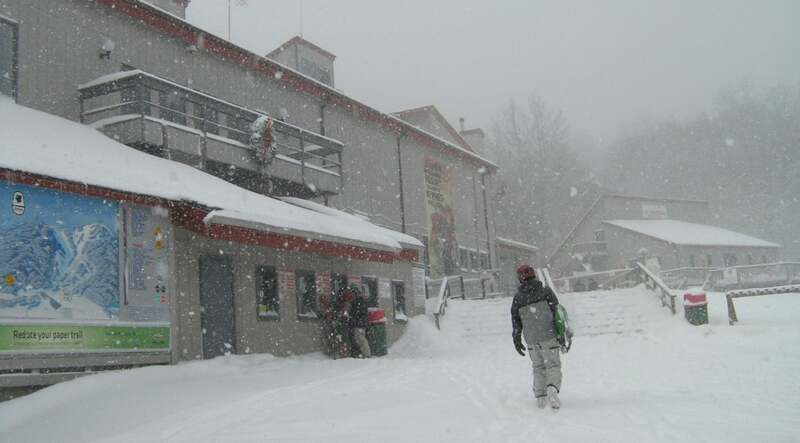 I think that every year for eight years or so I have skied in mid to late November, usually at Cataloochee but also at Beech and Sugar. 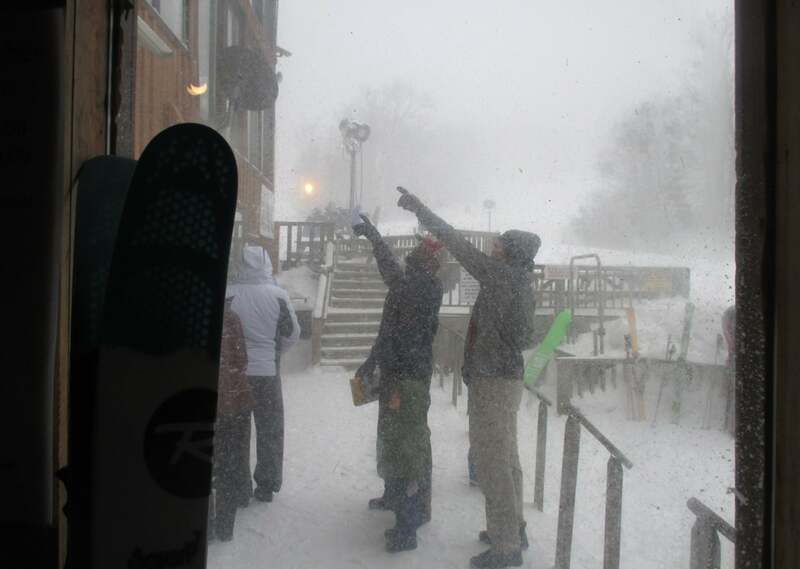 In fact Cataloochee and Sugar often make national press for their early openings. Anyway, apologies for the long way round to the topic. 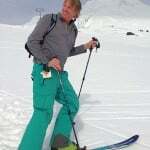 Here is the crux of the matter, if you will ski from the first opening until the last closure, as you should; then now is the time to consider the options of a season pass or paying for tickets as you go— both can make sense in my opinion. So here are the raw details, each resorts season pass price and daily weekend and weekday rates are listed. I also provide a number for Days ‘til Paid; derived from a complicated proprietary formula of my own devising; this tells you how many days paying full price at the window would equal the upfront cost for a season pass. A couple of points, while window rates have remained the same or risen slightly from last year a few season passes are actually cheaper. Also this year a few resorts are again offering Flex tickets. I love these as they allow your session to begin when you actually arrive on the slopes; which is much appreciated by those of us who get late starts, have a long way to drive or are logistically impaired. Appalachian is offering this on their eight hour sessions and Massanutten and Wintergreen are also providing this on eight and four hour sessions. So there’s the data and now the question, to pass or not to pass? 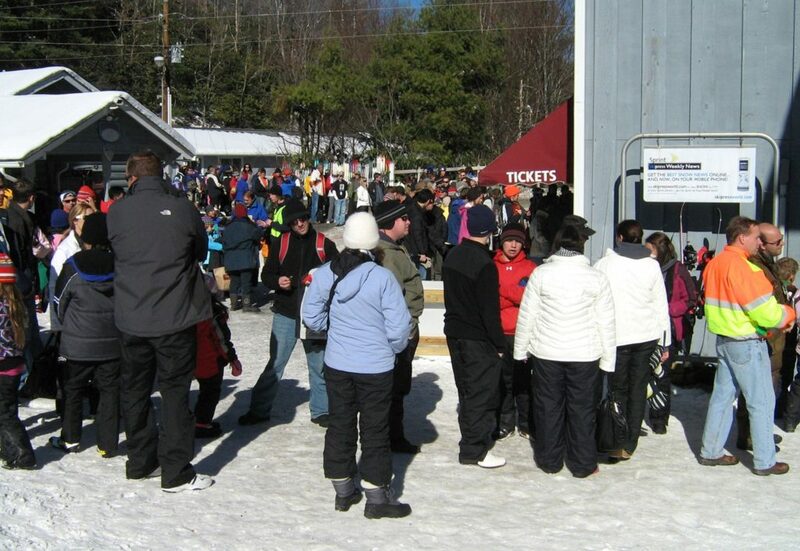 One reason some mountains may have lowered season pass prices could be the difficulties many pass holders faced last season in getting enough days on the slopes. Hopefully this season won’t present the same… challenges … shall we say? And let’s face it with some total holiday shut downs the last two seasons, buying a pass can feel like a gamble. In light of these realities paying as you go has its appeal, particularly if you can take advantage of weekday rates. Despite these uncertainties my belief is if you plan to go to the same mountain five or six times this season, then buy a pass. It’s more than just a matter of breaking even monetarily; it’s also about being a part of the place. I spoke of early openings before; facilitating that is another reason to consider a season pass. This gives your adopted mountain some upfront money to help get their snowmaking infrastructure fired up, and that is becoming more critical every year. So embrace your favorite mountain and commit. Not moved by the warm glow of loyalty? Consider the advantages of gearing up in a toasty lodge while others are suffering at the ticket window. 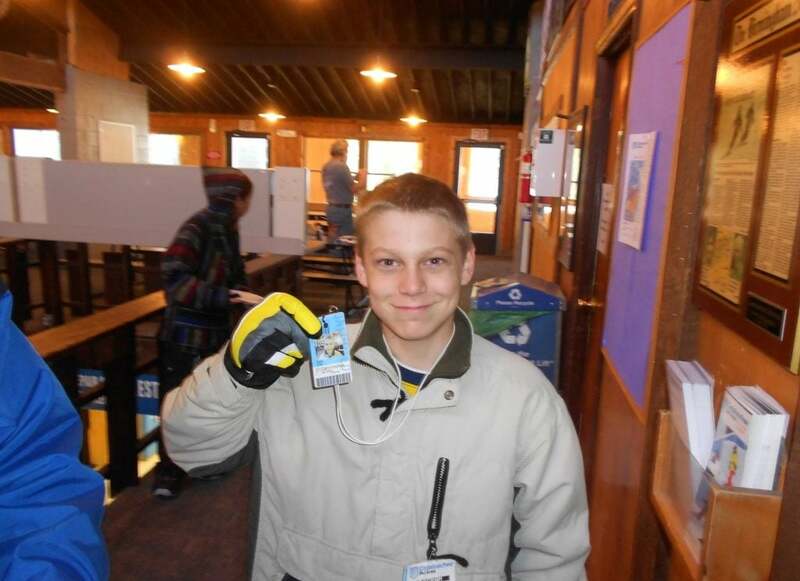 And of course the biggie – don’t wait in line, hit the slopes straight away; after all, that is the reason why you came. Joy of the upcoming season to you all, may it snow early and often well into next April, Amen. Previous articleOktoberFest at Sugar Mountain (and a Fall Color Update) for Leaf Lookers!